Last week, I posted a photo of the Schlitz Lionel O Gauge billboard that I scored at the Christmas Train Show out in Wheaton and hinted that we bought a few more things. 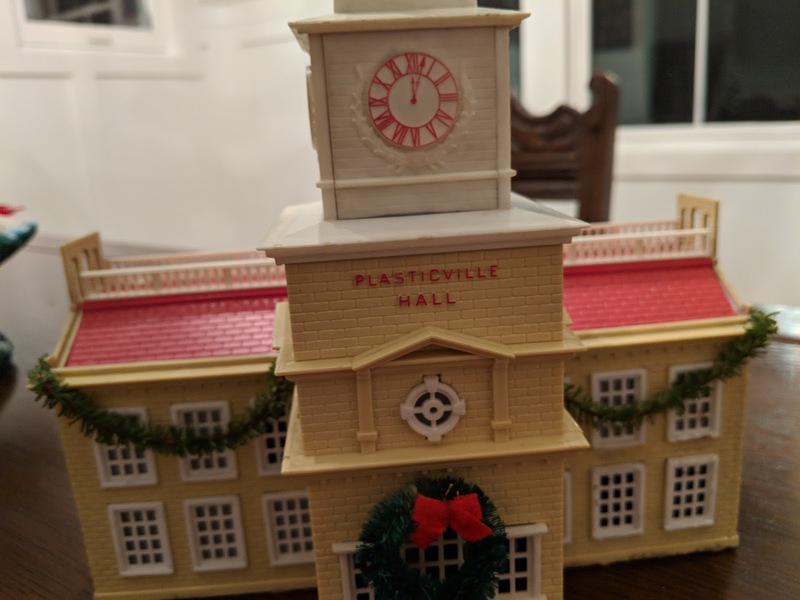 Today, you see one of those: Plasticville Hall. 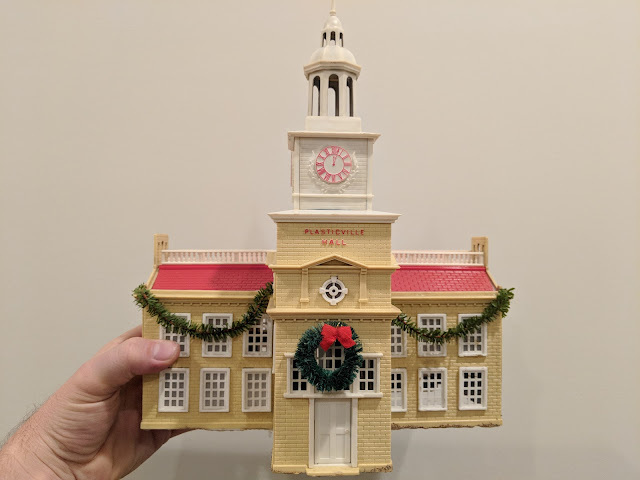 The version that I bought was fully assembled as you see it here and decorated by someone with some garland and a wreath over the front door. It is all doll'd up for Christmas time. And that's part of the appeal here for me: we only set up the Mantleburg Line as our traditional Christmas train. We have enough cars and rolling stock for Mantleburg, but we don't have that many accessories or buildings or structures, so that's what I've been focusing on at the show. I've come across some of these Plasticville structures and they never appealed to me. But for some reason (I'm pretty sure it is the garland and wreath!?!? ), this one called out to me. Five dollars later, it was coming home with us. Turns out, the one we bought is the original edition of this structure - released in 1955. Pretty remarkable that it is still in great shape, right? More than 60 years later? It was always the lucky kid down the street that had one of these on his layout. This is one of Bachmann’s most impressive structures and it was patterned after Independence Hall in Philadelphia. There are several variations in the name that is on this hall and we’ve shown these below. When first introduced in 1955, it was titled "PLASTICVILLE HALL" and was given the designation PH-1. The walls were TAN with a RED roof and WHITE trim. This version is pictured to the left. By the following year it was available as the No. 1776 "INDEPENDENCE HALL," and the walls were colored RED with a LIGHT GRAY roof. This same year would see the release of the RED walled "PLASTICVILLE HALL." This variation also came with a LIGHT GRAY roof and is found in the 1905 two-piece box. Mantleburg never had a town hall, so now it appears that we do! Now I just have to get around to setting up the Mantleburg line in the new basement. There's a birthday party down there this weekend, then after that, we'll have the freedom to set some part of it up to enjoy for the final week of Christmastime.